This year’s Community Reads book, Octavia’s Brood, is a science-fiction/fantasy anthology inspired by the work of Octavia Butler and focused on themes of social justice (in many planes of time). 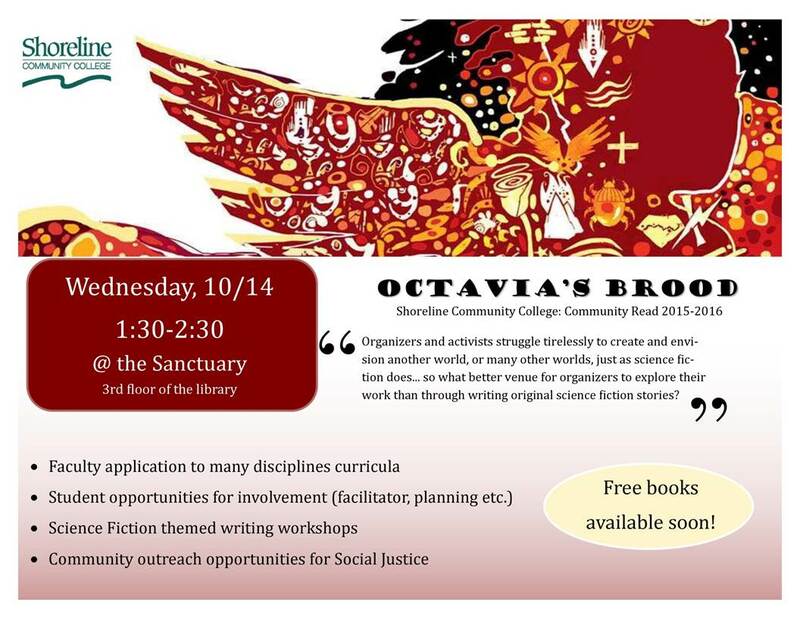 To kick off this semester’s community read, we’re hosting an Introduction to Octavia’s Brood event this Wed., Oct. 14 from 1:30-2:30 p.m. on the third floor of the library. Refreshments will be served. We’re going to display a webpage for community reads containing many resources for anyone interested in the book. We’re encouraging students, staff and faculty to attend and learn more about this book and the activities that will be planned around it in the coming year. We’re hoping to get some students at the kick off interested in the topics of social justice, science fiction and creative writing to get involved with the book group portion for next quarter. We’re also hoping to get more staff and faculty involved in the read itself. If you’ve ever been interested in any of the above spread the word and we hope to see you there! 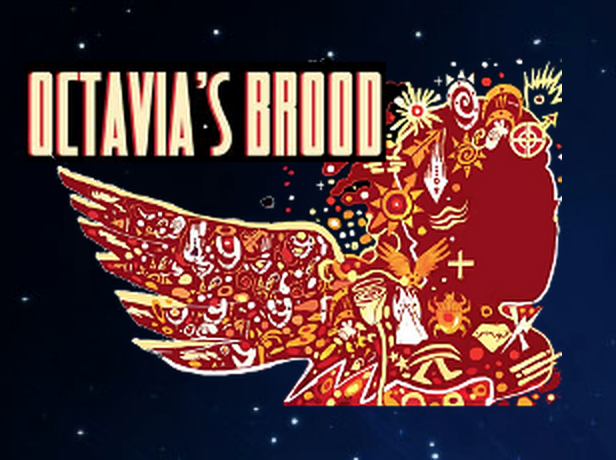 In case you’ve missed it, the Community Book Read book for 2015-16 is Octavia’s Brood, a collection of social justice-themed science fiction stories. And now the Seattle Public Library is hosting a conversation with two of the contributors to Octavia’s Brood from 5–8:30 p.m., on Wed., August 26, on the Seattle Central Library’s Atsuhiko and Ina Goodwin Tateuchi Plaza. The two contributors—Walidah Imarisha and Gabriel Teodros—will be discussing the book, their stories, the inspiration and legacy provided by African-American science fiction writer (and Lake Forest Park resident) Octavia Butler, and the connection between science fiction and social justice. Several faculty, staff, and administrators are planning to attend the event and would like to encourage others to join us. Imarisha co-edited Octavia’s Brood with Adrienne Maree Brown and wrote one of its stories (“Black Angel”). On the faculty of the Black Studies Department at Portland State University, Imarisha is billed as a “writer, organizer, educator and spoken word artist.” Teodros is a multiracial—he claims, Ethiopian, Scottish, Irish, and Native American descent—Seattle hip-hop artist. His story, “Lalibela” appears in Octavia’s Brood and, in addition to talking about his writing, Teodros will also perform at the library’s event. Octavia’s Brood is a collection of social justice-themed science fiction stories that feature things like time travel, shape shifting, dystopian worlds, re-imaginings of “model minorities,” and the possibilities of using visionary fiction to develop new ideas of future worlds. The works are inspired by the writings of Octavia Butler, an award-winning science fiction writer (Kindred, Parable of the Sower, and Lilith’s Brood) who lived in Lake Forest Park before her death in 2006. Shoreline Community College has adopted Octavia’s Brood as it’s community read for 2015-2016 and is developing events and programming to generate conversation and action around the themes explored in its pages. The entire campus community—staff, administrators, students, and faculty—will be invited to read and discuss the stories inside Octavia’s Brood during winter quarter, and faculty are being encouraged to incorporate some of its stories into their classes in the coming year. Community read organizers are also hoping to bring some of the people behind the book—like Imarisha and Teodros to campus—for conversations about social justice, science fiction, the art of writing, and reading appreciation. Click here to find out more about the Seattle Public Library event. And click here if you’d like to find out more about Octavia’s Brood. If you would like to know what you can do to become involved in the college’s community read, contact Yvonne Terrell-Powell or one of the current community workgroup members (like Caroline Conley in the library, Joyce Fagel in sciences, or Tim Wright in history and multicultural studies). Friends & Colleagues – We need your help. Please consider nominating a book for the 2015-16 campus-wide Community Book Read and participating on the Community Book Read Selection Committee. The SCC Community Read Program needs you! What is the most inspiring book you have read in recent years? Nominate it! c) If possible, suggest potential events that we could sponsor at SCC that relate to the book (i.e., speakers, films, presentations). e) Have you used the book in one of your courses? f) Are you interested in using the book in one of your courses? Join the Selection Committee: this group will consist of 5-11 representatives from faculty, staff, students and administrators of the college community. If you are interested in participating in the selection process for the 2015-2016 Community Book Read, Contact Lianne Almughirah, lalmughirah@shoreline.edu, by Friday, April 17. The SCC Community Book Read Committee is currently in need of your assistance in choosing a book for next year. We need book recommendations and volunteers to serve on the 2015-2016 Book Selection Committee. Book Nominations for the 2015-2016 SCC Community Book Read are needed by Friday, April 10. Please send book nominations via email to crworkgroup@list.shoreline.edu. If possible, suggest potential events that we could sponsor at SCC that relate to the book (i.e. speakers, films, presentations). Have you used the book in one of your courses? Are you interested in using the book in one of your courses? The Selection Committee will consist of 5-11 representatives from faculty, staff, students and administrators of the college community. If you are interested in participating in the selection process for the 2015-2016 Community Book Read, Contact Lianne Almughirah, lalmughirah@shoreline.edu by Wed., April 8.